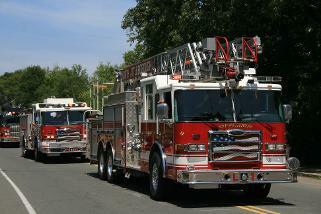 ONE OF THE BEST FIRE TRUCK AND FIRST RESPONDER PARADES IN NEW ENGLAND! YOU'LL SEE VEHICLES FROM ALL OVER NEW ENGLAND ON HAND TO SHOW OFF THEIR NEWEST EMERGeNCY VEHICLES AS WELL AS THEIR CLASSICS! FUN FOR ALL AGES, GET A CLOSE UP LOOK AND SEE WHAT THE INSIDES OF ALL TYPES OF VEHICLES LOOK LIKE! VEHICLES INCLUDE, BUT NOT LIMITED TO: FIRE ENGINES, AMBULANCES, POLICE VEHICLES, EXCAVATORS, DUMP TRUCKS AND CRANES.